Have you ever had a Crazy Hair day? I have them all the time, but I don't ever remember having them on purpose in school. 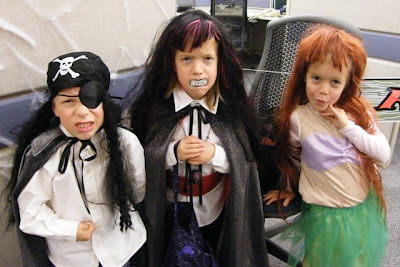 There are the triplets, after their mother spent hours on fussing with making their hair look "Crazy" for the big Crazy Hair Day at their school. 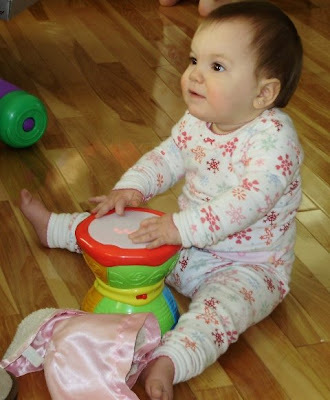 About 10 days ago, Aurora took her first steps. Right now she's visiting with Aunt Kiki and Uncle Kenny and cousins Jessie and Emmie for a few days because her babysitter is on vacation this week. Uncle Kenny took this little video of her walking. She's getting pretty good with her balance. I watched this over and over. Have a look, it's only about 13 seconds but so cute. So it was my intent to show some crazy quilting progress on Monday, but I didn't think I had enough to show. I only had some lace bits applied and I only started actually stitching yesterday. I'm excited to tell you about this. 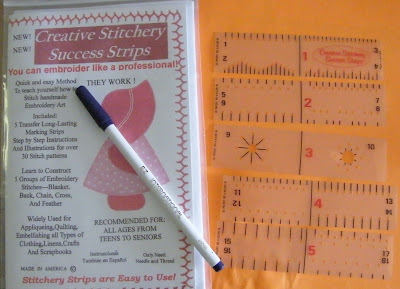 In November as I was almost finished my first CQ project that I started in Linda H's Crazy Quilting class, I purchased a set of CQ stitching templates from Creative Stitchery Success Strips. I learned of these from CQ4fun's blog. She had recommended them with the disclaimer that you should not expect your stitching to be perfectly even, even with these strips. So, yesterday was the first time I had used them since I received them. I can tell you that after a few simple lines of stitching, that I LOVE THEM. I found I could whip through a row in not time. As a newbie, during my first CQ project, I was constantly thinking, "Am I going to run out of room and have to squish the last stitch in?". Not that I worried too much over it, but I love to know how my line will end. I'm going to go back and review CQ4fun's blog entry that is listed above and review how she used them and start incorporating some fancy lines into my new project. Here are a few my great first lines of stitching using the Success Strips. See how even they are! I'm so impressed with myself. Or should I say I'm impressed with how this product helped me. 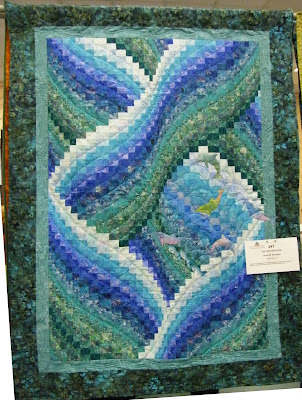 The is the last of my Myrtle Beach quilt show. This quilt has help me solve a problem. 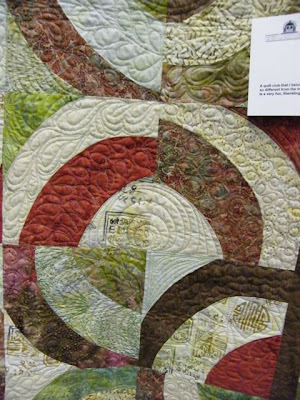 I loved looking at this quilt, not for the color, but for the way the maker, machine quilted it. It looks like it was done on a domestic machine. See, I made this same Red Onion quilt (different colors) last spring. It's from the Stack A New Deck book. I was making it as a cozy lap quilt for my Dad and picked the pattern cause it's kind of manly, and I purposely put 3 onions in it to represent his 3 kids. The funny thing is, that Dad loved onions, but my brother and I are not fond of onions at all. My sister can take them or leave them. 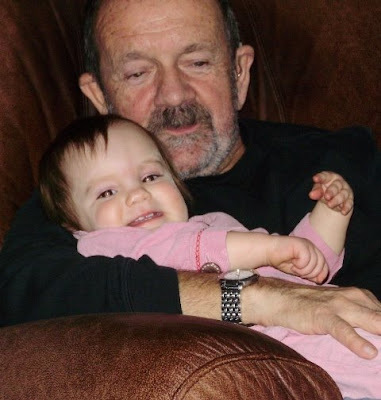 Anyway, before I had a chance to send it out to be quilted, I was called to Nova Scotia to be with Dad and the rest of the family when he suddenly took gravely ill. Sadly he passed away a week later. So, I've had this onion quilt done for almost a year, and I just didn't want to do anything with it. I didn't even post a picture the finished quilt top to my blog. I barely had the energy to put the plain borders on before rolling it up , putting it in a bag, and stashing it away in a corner. I had an appointment to get it machine quilted, but then I thought, why spend a couple of hundred dollars, just to ultimately get rid of it. So it's been on my UFO list and I've been thinking and thinking of what to do with the darn thing. This week, after seeing this same quilt at the quilt show, machine quilted on a domestic, I have a whole new attitude toward my unfinished quilt for Dad. Maybe it's time that has passed and I can better deal with it. I've decided when I get home, I'll machine quilt it myself and use it as a fund raiser and donate the dollars to something. 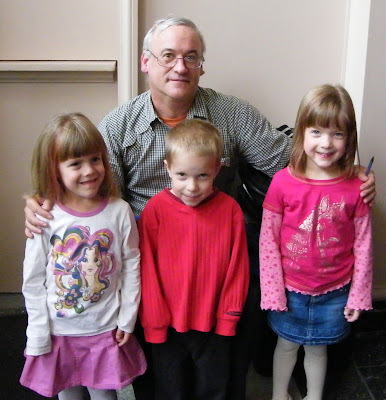 Alternatively, Dad died with complications from Diabetes, so I may contact the Diabetes Association to see if they have any fund-raising activities coming up and they may be able to do the ticket-selling. I guess there's a moral to this story. If you have a quilt, put it in a quilt show. 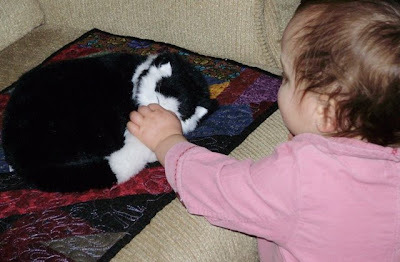 You never know who will need a bit of quilt therapy to help her get over the death of her Dad! Thanks Catherine Blackwell for displaying your quilt. I'll post a picture of my "Three Onions" so you can see it when it's done. 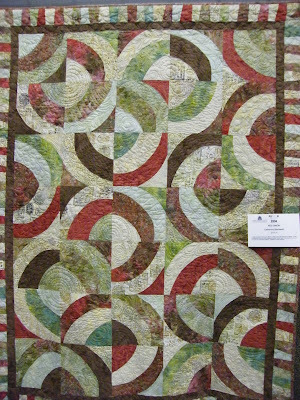 So, instead here is part 2 of my notable quilts from the MB quilt show.. These 3 are very traditional scrappy patterns. I've left the pictures bigger so you can click on them to see detail. 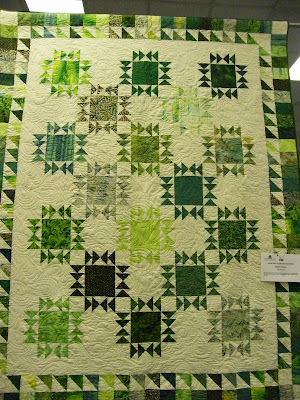 This first quilt made with scrappy greens, was very striking. I liked the borders, but I can't quite figure out how the blocks go together. The components are simple and I figure it must be put together in long rows and not blocks.. It's a mystery to me....I'm sure I've seen this quilt in one of my scrappy quilt books, but not sure which one. Do any of you know? I wish I was near all my books...I like this one and it's definitely one I would consider making. 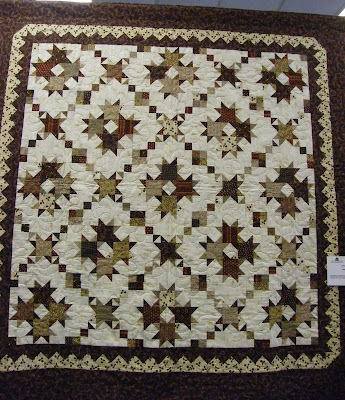 The next scrappy brown quilt is in the same category with the first one. OK, can you tell I love scrappy traditional quilts. 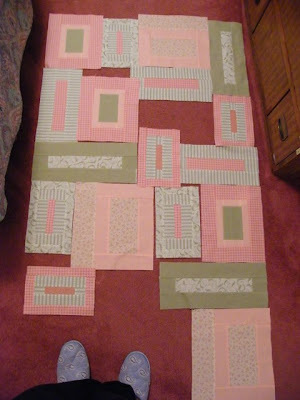 I can't quite see where the blocks start and and where it ends in this one. . More experienced quilters would know. I am sure I've seen this quilt pattern before at a show in Freddy Beach, but I can't say where for sure. I have a bunch of purples that I'd like to make a scrappy quilt out of. I think one of these 2 patterns might be perfect for my purples. The quilt show did not disappoint. There were more than a few quilts I really liked. Today, I'll show you 3 quilts that I thought were quite different than what I've seen in the past year.. On Tuesday I'll show you another 3. Click on the photos for more detail. This first quilt was striking. It is done using the cathedral windows method to product subtle curves in the blocks. 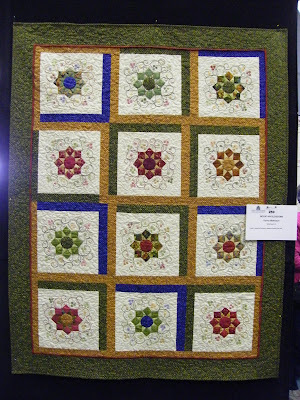 There were a number of these quilts at the show, so it must have been a local workshop teaching this cathedral variation. The machine quilting was very nice on this small quilt. The maker said this next quilt was inspired by a pattern in a Patchwork magazine. What I loved about this quilt was that it was a combination of machine piecing, hand stitching and machine quilting. I love swirly things so the design was pleasing. 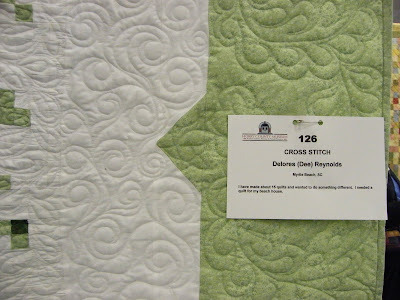 The third quilt that I thought was clever was more the title of this quilt. It's called Cross-stitch. I was fairly close to the quilt and didn't quite get what the intent of the name was. It was like a water color gone bad. Then I came in closer to see if I could see cross stitch. Nope. Stepped way back and then I could see, it looked like one of those color coded cross-stitch patterns. I chuckled to myself and I decided I really liked it. Every time I look at the picture, it makes me smile. I enjoyed looking at the machine quilting. It was custom machine quilted beautifully. The maker of this quilt said this was for her beach-house. Today I'm going to a quilt show sponsored by the County museum. They said last year, it had over 200 quilts. I've been looking forward to this all week. Watch my blog tomorrow for pictures. The show isn't judged, just a viewers choice will be awarded... so I think I'll so you the Gail Awards. I'll pick my top 3 in a couple of categories and show you. For my quilt workshop in Florida next month, I've decided to go to the Ricky, Libby and Alex Seminar. I'm pleased with my decision and I was pleased for the comments you gave me. It affirmed my decision. My registration is gone and my hotel reservations made. Now I can't wait! I'm starting to work on my Crazy Quilted Socks this evening and tomorrow. On the next 4 Mondays blogs, I'll so you some crazy progress..
Did you ever wonder how you would use all the math training you got in school? I often wondered, as I did my high school math, how I would use these skills. While I used lots of these skills in my computer career, I find now, that in my quilting, I used the old manual formulas daily. I have a unique problem that I might need some help with. Help from some of my friends who have a bit more in depth math skills than I have. 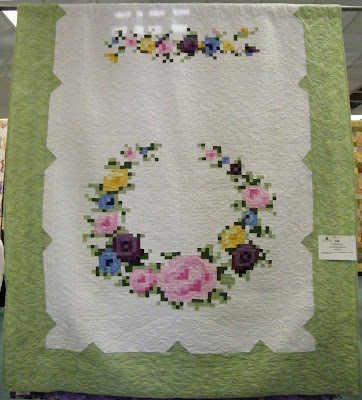 You might recall that last fall, I went to a quilt show and fell in love with this baby quilt that was done out of Nancy Halverson Winsome book that features quilted things for babies. With 2 of my friends having babies in the new year, and a cute quilt for Aurora in mind, my friends Linda G., Lois, and Valerie helped me shop for the right colors. Lois then helped plan out the quilts with the colors that I bought. I carefully, according to the color code key and the precise measurements, proceeded to cut out all the blocks for 3 identical baby quilts. I set all this aside to be my Christmas Break project. Easy sewing once all the cutting is done, right? Well, something that I absolutely never thought about, was the fact, that these 2 unborn babies might not be girls. Shortly before Christmas, in fact, one of the new babies is going to be a boy. And, to top it off Aurora's mother tells me that she already has 2 baby quilts and she's not sure that at this point, she needs another crib size quilt. I'm moving on to Plan "B". I've purchased traditional and non-quilty gender neutral gifts for the 2 babies that are about to be born and I need to re-think about what I'm going to do with the 3 baby quilt tops. thinking, thinking, thinking.... for the past month I've been thinking. So, here's my plan. I'm still going to sew all the individual blocks together. I have 6 (times 3) blocks out of the 16 (times 3) blocks done. When I have them all done - a total of 48 blocks of various size rectangles - I plan to amalgamate all blocks into a single size quilt for Aurora. I'm hoping that what would be 3 baby quilts sized 42" x 52" will fit into a single quilt. I may have to add a sashing here or there, but thank goodness I have some extra fabrics from all the cuts that I made and I didn't cut the borders at all. It's much to early to play with a layout, but here is 1/3rd of the blocks (out of 48). It's a rainy overcast day at the beach, so that means it's a sewing day for me today and this is what I'm working on. Just before we head back north next month, we're going to take a side trip to Florida. Two things are happening. My daughter and son-in-law along with their 2 kids are going to be there for a week's vacation, so we'll plan a little visit with them. But, just before they get to Orlando, there are 2 quilt/sewing related seminars happening in Florida. I bet I'm not the only quilter/sewer agonizing over which seminar to attend. Do I go to the Ricky Tims, Libby Lehman, and Alex Anderson Quilt seminar in Ocala, or do I attend this great Ann the Gran embroidery and sewing seminar that features as one of the educators, my long time favorite small projects sewer, Mary Mulari. She is the primary reason I'd like to attend this seminar. You would have seen Mary many times on Sewing with Nancy. She does great sweatshirt makeovers and many other small projects. Who would you go see? We're settled into our condo at Myrtle Beach. It's not the same condo as last year, but the same complex of 6 buildings as last year. 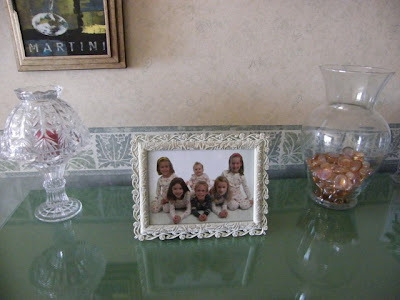 I took along my favorite picture, and set it on the hallway cabinet. Now I can look at my grandchildren all day long. We've already tested out the video calls on the computer and it works great, so now I feel right at home. Here is a picture of the view from our 3rd floor balcony. Our condo this year is in a building that is situated behind the swimming pool. Here is a picture from our 3rd floor deck. Of course it's much too cool to go lay by the pool, it still is an inviting view from our balcony. It's 15 degrees C today but our building and deck are sheltered by 2 other complex buildings flanking our building. It is protecting us from some of the cool breezes so believe it or not, we're sitting on the deck this afternoon enjoying the bright open sun, and the swishing of the ocean waves. 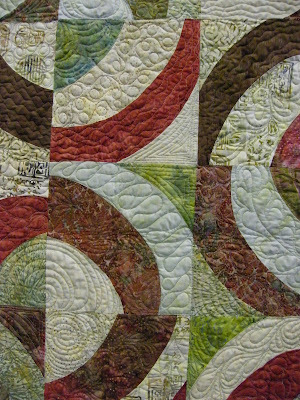 If you get a minute, my friend Linda Hubbard and quilt teacher has launched her blog, Stitch Lines. She has been busy uploading pictures for her galleries and getting ready to lauch. I've added her to my sidebar, so you can check up on her anytime. Do you like Oatcakes? I'm not sure if oatcakes are an east coast delicacy, but I've never seen them when away. I loved the ones that came out a couple of years ago at Tim Horton's. The problem is, that not every store had them. Here is a recipe that someone just gave me and they said that they closely resemble the coffee shop types. I haven't tried this recipe, but I think I will soon. This is a large batch. I'll likely make half a batch. Remember, really good oatcakes are square, not round! Incorporate margarine with a pastry blender. Add a little water to form a rollable textured dough. On a counter sprinkled with oats, roll dough 1/2 inch thick. Use a 2-1/2-inch square cookie cutter or a pizza cutter to cut oatcakes into squares. Bake 15 minutes at 350 degrees. Do you have any Black and White pictures of yourself? 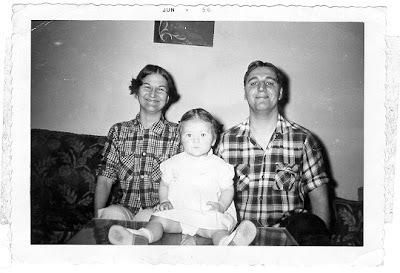 I think the year that this picture was taken of me and my mom and dad, must have been the last year that black and white was the standard in photography. 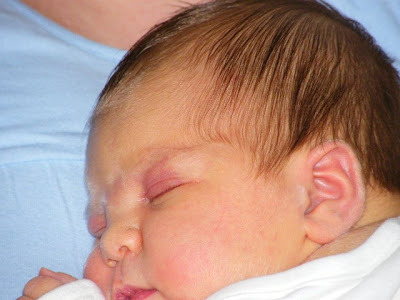 In my baby album, all my infant and pictures up to a year old were black and white, and after that, they were all color. I think this picture was so fun. Look at all the hair parted in the middle for fun, and the plaid shirts and hamming it up for the camera. Too cute. Do you remember the day you got your very first digital camera? Want to see my very first picture from my new toy.... Here it is. Feb 4, 2002. We can remember the day very clearly. 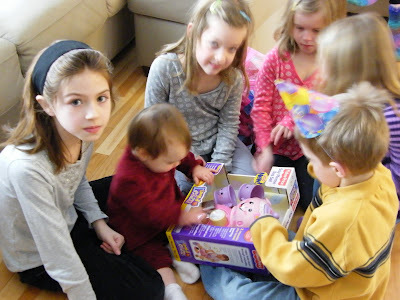 This Camera was a gift from my employer and we happened to get it on the day before the triplets were born... so that would have been 7 years ago last week. This is Mert posing with a silly grin. Little did we know that only hours later in the middle of the night would the triplets arrive...10 weeks early! Seven years later and while digital camera technology has come along way, our not so technical fridge is still covered with with grocery lists, magnets and pictures. Is it too early to be thinking Christmas? 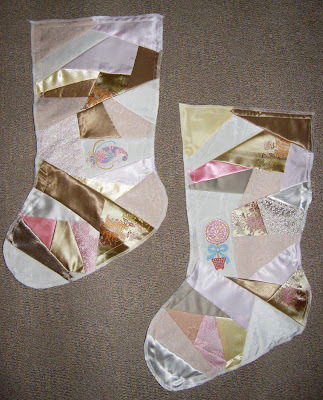 I have made these Crazy Quilt Sock bases to work on over the next 2 months. The real fun will start when I start embellishing. This will be my evening work while watching TV. I have to look back at my class notes.... what to do first... laces, I think. I'm in the process of building a little gallery on my sidebar. The first photos in my gallery are detail shots of my crazy quilted sock that my friend and crazy quilt teacher, Linda Hubbard took with her camera recently. I love the detail pictures. Have a look and let me know what you think. I'll pick out more projects and add them over the next few weeks. Also, my Selvage Cat Matt was featured on these 2 blogs yesterday. 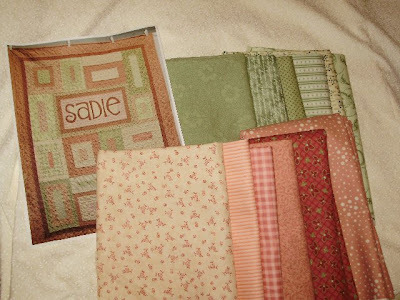 It really was a fun project and I'm saving selvages for another secret project that will be submitted into a quilt show in 2010. We had lovely little party for Aurora and it was great to have all the family around her for her first birthday celebration. I think she was a little overwhelmed at the number of people around her, the singing, a cake... a flame on the cake...icing... holy cow... "What is all this?" she seemed to be thinking. ..... But she was a good sport and really enjoyed all the attention the kids were giving her. After all the kids helped her blow out her 1 candle, we took out the candle and took off the hard letters, and let her explore the little cake on the table of her high chair. Before she could even touch the icing, it was AH, AH, AH SNEEZE.... whew...a big wet sneeze!!! then, ANOTHER SNEEZE. What funny! Poor Emily said "I don't want any cake!" not realizing I had another big cake for everyone else. Good thing, right Emily!! 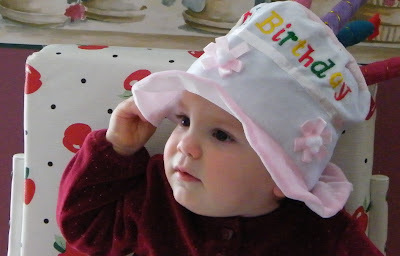 Today, our little Aurora turns 1 year old. 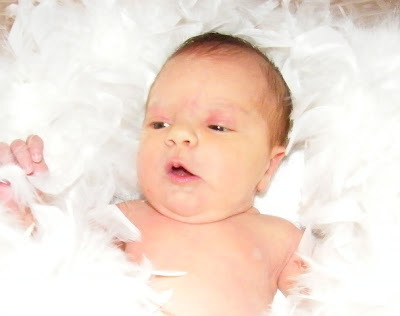 Can you believe, that all the little infant baby stages have come and gone. Sleeping through the night, cutting her first tooth, eating solid food, weening onto whole milk, weening off the bottle, first crawling, first walking, first sounds, first smile, first laugh, first toddling steps holding mama's hand. Here she is, only hours old. 1 week old - we were getting fancy with the camera. She is learning the ropes of posing. 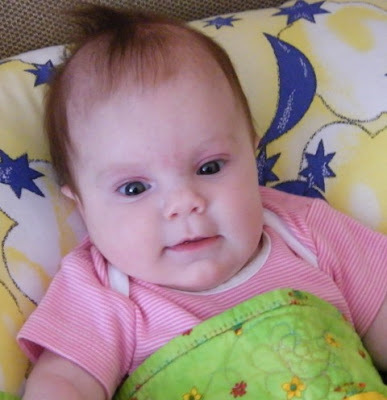 2 months old - isn't she bright. She has always had a natural little grin. Aurora - 5 months old. Testing out Emily's new quilt. 9 months old - she says hi just like her mama does. One had in the air! Just a week short of 1 year old. Starting to read. She's a cutie, but I think she's going to be a smartie too. We have a fairly new Michel's Craft store in our city. They publish 40% coupons regularly in the newspaper, and then when you shop there, they sometimes give you another 40% off coupon a single regular price item. Most of you know, that I love a bargain, so I always try to use my coupons on necessities. 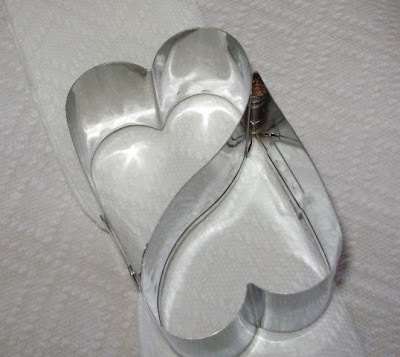 Last week, one necessity I just had to have was this cute, cute Wilton cookie cookie cutter that cuts out 2 wonky heart shapes at the same time. Looking a little closer at the package, this cookie cutter, is a brownie cutter and it says that it can be used for cutting out sandwiches too. This is neat since up until a few years back, I made brownies every week. I used a simple recipe that used stuff that I had in the house. The recipe freezes well and was no fail. As of earlier this week, I didn't have occasion to use my new cutter and I happened to be browsing in Michael's again , and saw a nice brownie pan. 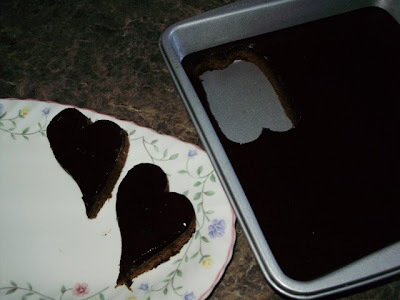 My old pan was well used, but I thought, if they have brownie cookie cutters, the new Wilton brownie pan that comes with a plastic cover must be made so that the heart brownies can be cut efficiently with very little waste. So that became another necessity, and I used another 40% coupon. I was right, in this new 9" x 9" pan, I can get 6 sets of of 2 brownies, so 12 nice sized brownies, and a very small amount of scraps. My old brownie pan was 7 x 11" and I wondered if my recipe would make enough batter. My math brain says - 7 x 11 and 9 x 9 both make 81 square inches but I had to try it today. It turns out, my recipe is perfect for this. There is the exact amount of batter, and the exact amount of icing. Here is my pan of iced brownies. Getting ready for the first cut. It worked great, but the brownies stayed in the cutter. I had to use a fork to poke out the brownies on to the plate. A suggestion from Gail, one of our Friday coffee girls, helped. A bit of cooking spray on the cutter, and the second cut worked better. Then when you add a bit of a wiggle to the cutter, it was the final touch needed to perfect the cutting so that the hearts would stay in the pan and then I could scoop them out with a little spatula. For those of you who asked for my brownie and icing recipe, here it is. I like this recipe, because it doesn't call for chocolate squares, or chocolate chips. Those things mysteriously disappear in his house. By request, I'm giving more detail in the method than usual... - you know who you are! Cream butter, sugar and egg. Add the rest of the items and stir until the flour is incorporated. Batter is a bit stiff, and there doesn't look like there's much, so no licking the spoon. Plop about 6 spoonfuls into your brownie pan, and then just flatten the batter a bit to join the plops... If you pour all the batter in the pan at once, it's hard to spread out to the corners . Bake at 350 degrees F for 20 min. Just when you take the brownies out of the oven, put all icing items in a microwavable dish. Mix by hand until a thick batter like consistency and all the icing sugar is incorporated. Microwave the icing on high for 30 seconds. Remove from microwave and stir/beat for about 10 seconds. Microwave for a further 30 seconds and watch closely for the icing to bubble up. let the icing bubble up for about 7 - 10 seconds. Remove from microwave and stir down the sides for 10 - 15 seconds. Then pour this liquidy hot icing over the warm brownies. Let stand for 1 hour to cool and give time for the icing to set into a smooth shiny brownie topping. 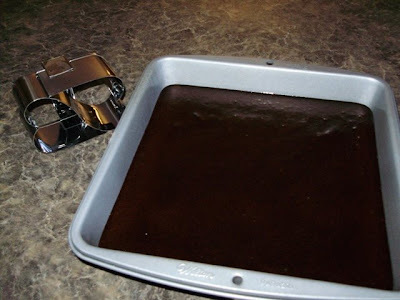 Then use a knife or Wilton brownie cutter to cut the brownies. Yields 12 large heart brownies, or 24 smaller brownies. 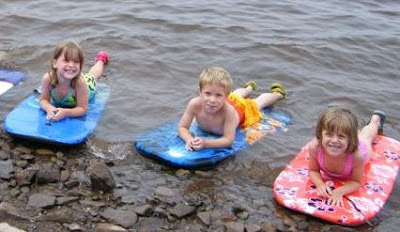 Grace, Caitlin and Mitchell were all born in the middle of the night, 7 years ago today. 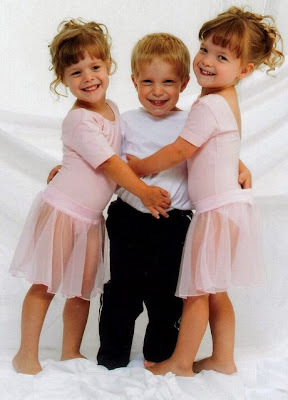 It's wonderful to see how these three babies, have grown into smart, polite, beautiful children who we love very much. 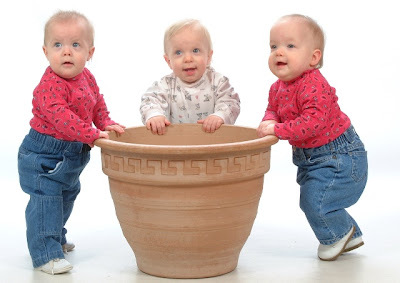 This is my favorite infant picture. About 10 weeks old and all sleeping in the same crib. This only lasted for a short time, because soon, their sleeping times were not always at the same time. It's fun to wear Jeans and getting out to get portraits done was quite the little outing.
. Rub - a - dub - dub, Three babies in a tub. How many times did we sing that little song. Did you ever notice that I have a blog listed on my favorite blogs sidebar called Marys Quilts. I've been following her since I started blogging and I put her on my sidebar so it's easy to follow what she's doing. 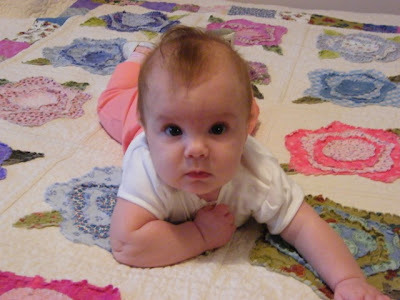 She shows many nice quilts, many are scrappy, which I love. 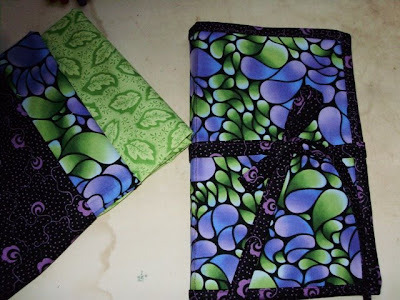 She develops traditional patterns and offers them on her website for free. 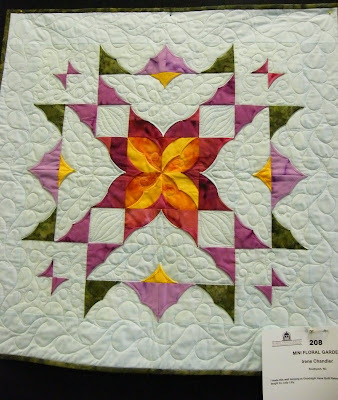 Mary is a longarm quilter who quilts many donation quilts. I don't keep count, but she lots every month. She pieces some herself, and other people send them to her to quilt, bind then donate. 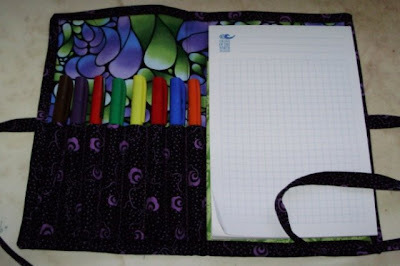 Anyway, on her blog entry the other day, she asked if anyone would make her a graph paper/pen tote that is shown at this link. It's a great pattern that holds 8 pens and a 5" x 8" pad of graph paper. It closes up with a tie. So I made one today for her. 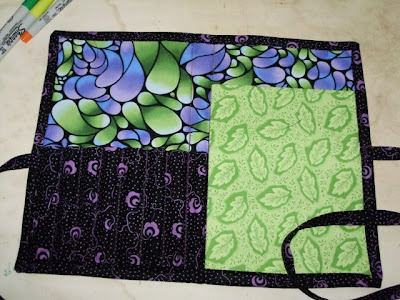 This funky purple and green fabric reminds me of the wonky feathers that Mary does on a lot of her quilts. So, here it is. I'll have it all packaged and addressed and I'll mail it to her when we get to Myrtle Beach on the 14th. 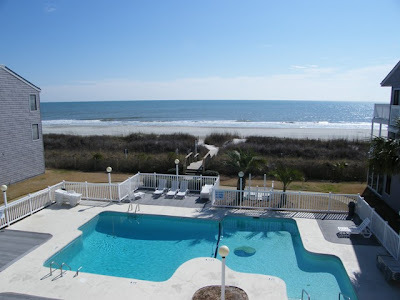 In 10 days, hubby and I will be leaving the mountains of snow in our yard, to go to Myrtle Beach. Last year was our first year to do the snowbird thing and we really enjoyed just getting out of the cold and carry on with our normal routine. We don't consider this a vacation, but for not being a vacation, we're really looking forward to get out of Dodge! We rent a condo on the beach, cook our own meals and go for our daily walks. We pretty much do everything we would do at home. The weather is warmer than at home but certainly not too warm. The month of March will be 20 - 25 degrees. 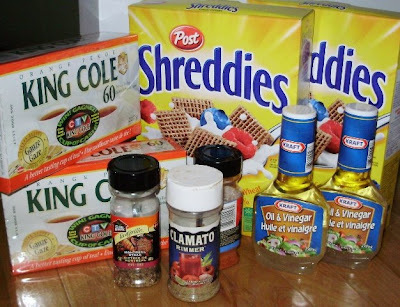 Last year, we made a list of groceries that we can't buy or couldn't find in the States. So we're starting to buy things now to take with us. Who knew that you just couldn't buy Shreddies anywhere! Not so. We spoke to other Canadians who searched for the staple last year, without luck. I knew that King Cole or Red Rose tea would be hard to find so I brought that last year. . Also, a Caesar drink is just not the same without the rimmer. I think a Caesar is a Canadian thing. Next, I start packing up a few sewing and knitting projects. It's hard to decide what and how much to bring. Last year, after a couple of weeks, I regretted not bringing anything to work on. 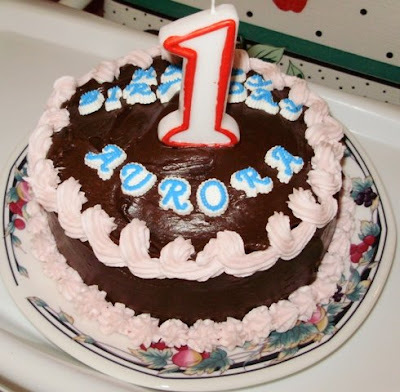 The next time we see Baby Aurora, she will be one year old. That will be next weekend and we're having a party to celebrate. I can't believe how quick the past year is gone. She was here this weekend for a short but special visit. She got to see her God-mother Michelle who lives in Antigonish. She brought a birthday present which Aurora loves. Here she is kissing the elephant. 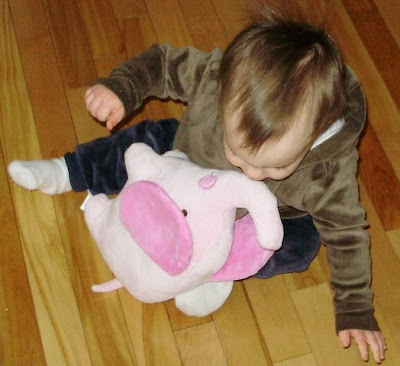 This little elephant is so soft and cuddly, just perfect for snuggling with. Aurora also got to meet Missy. Missy was cooperative and let Aurora kiss and pat her a little bit. Aurora was very gentle. 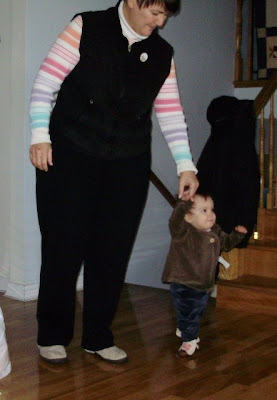 Aurora now likes to walk with one hand. She's very steady, and I expect within the next few weeks, she'll be taking those very first steps. I hope I get to see her walking before we head south. 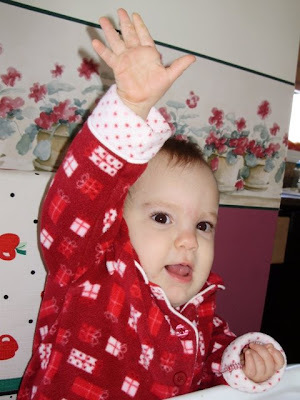 She also now points to pictures. Both Patience and I heard her say her name.. It sounded like Ra Ra... and when she said it, she was pointing to her baptism picture on our picture rack. Patience and I looked at each other - wide eyed - did she really say her name?? We tried and tried to get her to say it again, nope... I'm sure she'll say it again in due time. Easy name to say though. She likes to sit and cuttle and read stories with grampie. He reads her stories and she likes that. 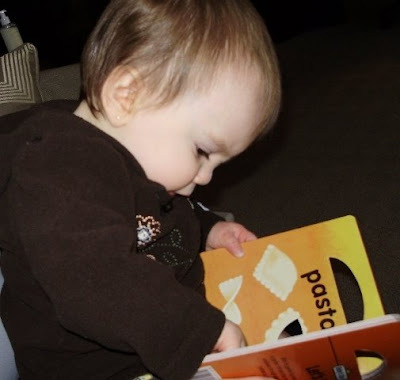 She kisses the pony book all the time. I think she's going to be just like her cousin Grace, and love all animals... elephants, cats, and ponies. We had such a lovely visit and can't wait until she comes back next weekend. Watch next Sunday for pictures of her birthday party!